I can’t believe that it’s time for another Week In Review. That’s the great link up hostessed by the lovely Meghan at Clean Eats, Fast Feets. I also can’t believe that it’s another week when I Didn’t write my post on Sunday so here I am Monday morning scrambling to get it written. We WILL correct that next week. ~Last Monday was another and hopefully our last snowstorm. I am so sick of snow and any of you who read BCDC on a regular basis know that and are also sick of hearing me talk about it. I’m seriously hoping that this will be our last. I thought that if I approached the snowy day with a positive attitude, I might get some spiritual or real world reward out of it. I decided to get busy. I’d heard about the storm in advance and was ready. That preparation and readiness allowed me to put at least my morning to good use. Commence the tale of the Three Crock pots. Yes, you see three, count ’em three (how many times can I use that?) crock pots all at work at the same time. Beef stew for Ralph, lentils for me and Weight Watchers veggie soup for me. I felt pretty excited about this whole thing. Ralph thought it was pretty funny. We have relatively little counter space so this was an accomplishment. During the cooking process the veggie soup was actually working on a tray on top of the stove. All worked out well. It was a first time for the beef stew recipe and Ralph really likes it. With a few seasoning adjustments, it will enter the rotation. 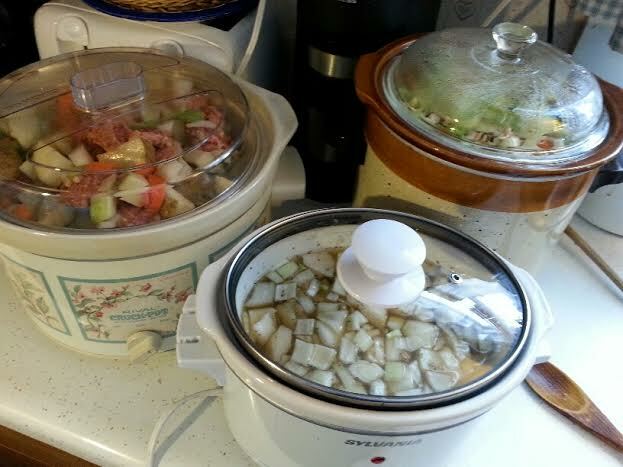 Love my crock pots and I think they’ll be working today later on. ~I worked on my morning pages for The Artist’s Way every day. Again, I have to say, that I’m amazed that I have continued with this routine. I love writing my pages and can’t imagine allowing myself to miss a day. I actually completed my very first notebook. That’s a lot of writing!! I’ve started a new one and I plan to keep going. I can’t believe that there are only three sessions left. Twelve weeks seemed so daunting when I first started. It’s been great and I’ve met some interesting people who I think have become friends. I’m happy that I joined. ~I also meditated every day. Each day I do it, it becomes more and more natural. I love the music apps that I’ve downloaded to my phone. They’re great and I have several so that I can switch them up. Have I said that before? If I haven’t, now I have. If I have said it before it’s still true. I keep trying to fit in an evening meditation. That hasn’t worked out yet. I’ll keep working on it. ~As I look at this Week In Review, I see that I’m not accomplishing much else other than my usual routine. I was actually writing about that in my morning pages today. I need to get some real projects accomplished. Now that the weather is better, it’s warmer and there’s no ice and snow outside, I think I can do that. My goal for this week is to get together all of the thinks I’ve been gathering (in different parts of the house…) that need to go to the thrift store, get them out of the house and into the car. Then make the trip to the store. That’s a good goal. If I get the stuff out-of-the-way, then I’ll have a clearer idea of what to do next. I also have a LOT of papers that need shredding. Tomorrow the recycling goes out. Perhaps that would be a good goal for today. Then it will be out-of-the-way for real and can go to live in recycling land. I’ll let that be my two goals for this week. Something is better than nothing. Usually, once I get myself started, I’m more likely to keep working. Everybody has to hold me to those two projects now. I’ll let you know next week how I did! Be sure to check out the Week In Review link up over at Clean Eats, Fast feets. Meghan is my inspiration. I want to be her when I grow up! Yay for getting things done – getting a routine going is great! That’s my biggest problem, is that I need to make a routine of the things I want to accomplish every day. I think the routine stuff can be the hardest to do sometime. Usually because it is routine and can really chew away at your time. Besides, you did have a day with 3 Crockpots so that’s huge. The most I’ve ever had going at once was two, so now I need to be like Fran and go for three. Hmm, I may need to buy a 3rd one first. Good job on the meditation; I’m still trying to do it a couple times a week, although I generally only end up with one. I’m thinking this can be the week to change that. Good luck with the recycling and the thrift storing. I say get it out of there stat. It’ll make you feel so much better without it hanging over your head. You’re too funny! I was pretty impressed myself with the e crockpots! I’ve gotten several of them at thrift stores. It seems that people either love them or hate them so if you find them in thrift stores they are hardly used. I’m really enjoying the meditation. It’s a great start to the day. I’m feeling back on track with my sorting and packing too. Have a great day, Meghan!! Wait – didn’t you do the three crockpots last week? Are you on a roll with that or is my short term memory going? You’re funny, Stacie! I posted the three crock pots on Instagram last week when it happened. This post is a review of that week so that’s why it’s here! Sorry to confuse you. Take care.